Rabbi Yosef Yitzchak Schneersohn, the sixth rebbe of Chabad-Lubavitch, was one of the most remarkable Jewish personalities of the twentieth century. In his seventy years, he encountered every conceivable challenge to Jewish life: the persecutions and pogroms of Czarist Russia, Communism's war on Judaism, and melting-pot America's apathy and scorn toward the Torah and its precepts. The Rebbe was unique in that he not only experienced these chapters in Jewish history — as did many of his generation — but that, as a leader of his people, he actually faced them down, often single-handedly, and prevailed. Rabbi Yosef Yitzchak was the only son of Rabbi Sholom DovBer, the fifth Rebbe of Chabad, whose devotion to the child's education is lovingly chronicled in Rabbi Yosef Yitzchak's voluminous writings.1 While still in his teens, the young Yosef Yitzchak he served as the right hand of his father. As the personal secretary of the Rebbe, Yosef Yitzchak's responsibilities included administrating the many civic and communal activities in which the Rebbe was involved. The young Rabbi Yosef Yitzchak, in full-length chassidic garb, was a familiar figure in the receiving rooms of the government officials, ministers, and nobles of Moscow and Petersburg. In 5655 (1895) the young rabbi participated in the great conference of religious and lay leaders in Kovno, and again in the following year in Vilna. At times soft-spoken and with words coming from the heart, at times audacious and threatening, but always fearless and determined, he demanded the repeal of anti-Jewish decrees, the stopping of pogroms and the cessation of the government's program of forced "enlightenment" of traditional Jewish life. 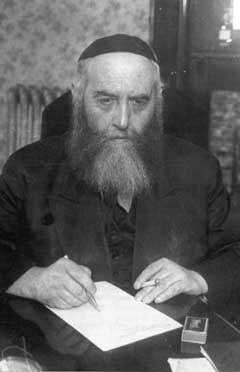 On Elul 13, 5657 (1897), at the age of seventeen, Yosef Yitzchak married Nechamah Dina, daughter of Rabbi Abraham Schneersohn and granddaughter of the Tzemach Tzedek, the third Chabad rebbe. During the week's celebrations that followed the wedding ceremony, Rabbi Sholom Dovber announced the founding of Tomchei Tmimim, the Lubavitch yeshivah, and the following year appointed his son to be its executive director. It was there, in the hamlet of Lubavitch in pre-soviet White Russia, that Rabbi Yosef Yitzchok trained the army of the faithful torchbearers who, under the impossible conditions of the decades to come, would literally give their lives to keep the flame of Jewish life ablaze throughout the Soviet Union. Upon his father's passing in 1920 Rabbi Yosef Yitzchak assumed the leadership of Russian Jewry just as Communism's all-out war on Jewish life was moving into high gear. His fight to preserve Judaism was characterized by his all-consuming mesirat nefesh - an unequivocally selfless devotion to the physical and spiritual needs of a fellow Jew and unshakable faith in what he stood for. He dispatched teachers and rabbis to the farthest reaches of the Soviet Empire, establishing a vast underground network of schools, mikvaos, and lifelines of material and spiritual support. Stalin's henchmen did everything in their power to stop him. In 1927 he was arrested, beaten, sentenced to death and exiled; but he stood his ground, and by force of international pressure he was finally allowed to leave the country. But in leaving the boundaries of the Soviet Union he left his emissaries and their infrastructure of Jewish life behind; these continued to function and thrive, preserving and even spreading the teachings of Torah and chassidism to this very day. When the all-powerful communist regime began to crumble in the closing years of the '80s, Rabbi Yosef Yitzchak's network of children's schools, outreach centers, and supply lines of kosher food and religious services simply moved out of cellars and attics into emptied Communist Party buildings. Upon arriving in New York after his rescue from Nazi-occupied Warsaw in 1940, Rabbi Yosef Yitzchak took on a no less formidable challenge: the frigid spiritual atmosphere of the western world. There was no telling Rabbi Yosef Yitzchak that his was a losing battle; from his wheelchair, he rallied the Jewish young of America under the cry that "America is no different," that also in this bastion of materialism the timeless truths of Torah can take root and flourish. He established yeshivas and day schools, a publishing house for Jewish books, a social service organization and community support networks throughout the country. By the time of his passing in 1950 he had laid the foundation for the global renaissance of Torah-true and chassidic-flavored Jewish life, heralded by his son-in-law and successor, Rabbi Menachem M. Schneerson. From early childhood, an almost painful yen to write nestled in Rabbi Yosef Yitzchak's breast. From the age of eleven he kept a diary, often writing in it for several hours a day. He also wrote an estimated 100,000 letters during his lifetime, some 4,000 of which have his been amassed in a 12 volume collection; many of these letters contain dozens of pages of chassidic teachings and lore. This in addition to thousands of pages of discourses, essays and impressions which he penned in the course of his life. There is no doubt in my mind that the sixth and seventh Rebbes are one soul. They are one continuous life. Their oneness will be once again be apparent when they return to us (along with Eliahu ha Navi) to introduce our beloved Moshiach. This will be very soon (G-D willing). 1. The tzemach Tzedek was the grandson of the Alter rebbe, and the nephew of his predecessor the littler Rebbe. 2. the 4th Rebbe (tzemach Tzedek) should have passed on "Rebbeship" to his eldest son, the bechor. However the youngest son Shmuel became Rebbe. The 7th Rebbe "our Rebbe) is the 4th generation from the Tzemach Tzedek oldest son. To Anon, Jackson All of the Chabad Rebbes are descendants of Rabbi Shnuer Zalman of Lyady, hence the name Shneerson. The leadership was generally passed down to directly from father to son, with two exceptions, where it was transmitted to sons-in-law: (1) Rabbi Menachem Mendel Schneersohn, 3rd Rebbe; and his namesake, (2) Rabbi MM Schneerson [without the h], 7th Rebbe. The Russian authorities once interviewed the 6th Rebbe (Rabbi YY Schneersohn), asking him whether the Chabad leadership is transmitted from father to son, or to the person most appropriate for the position? He replied: both...! why my father came to America In 1913, my father in Staradub, Ukraine, went to ask Rabbi Shneerson whether he shouod come to Palestine or the USA. My father's parents wanted my father too remain in Russia but agreed to the rabbi's decision. By letter from the rabbi my father was told to leave Russia and go to the USA. This letter of the rabbi was taken by father back to my grandparents who finally agreed with the rabbi's recommendation.